Next club meeting Monday 1st April 2019. Meetings are held at the Abbey Baptist Church, Abbey Square, commencing at 7.00 p.m.
· Our meetings will be back in the basement area as from the April meeting. At the start of the meeting, Michael reported on a remarkable sighting he’d had whilst on holiday in New Zealand. Looking around an exhibit, he noticed a photograph on the wall and was amazed to see one of the club’s members commemorated there. Closer examination revealed the photograph was of Ernest Shackleton, a virtual doppelganger of our own John! This was the annual club auction. Highlights from the auction included a 1905 halfcrown and an 1887 currency year set both of which sold for a hammer price of £300, closely followed by a 1790 Droz pattern halfpenny which was knocked down for £285. Several other lots sold for over £100. In total, the sale totalled £3,775 raising £377.50 for the club. Thank you to all the people who helped the auction to run like clockwork. Bloomsbury Coin Fair – 6th April. 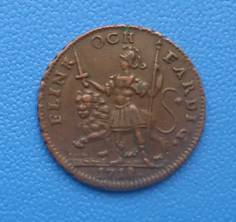 Midland Coin Fair at the National Motorcycle Museum 14th April. Warwick and Warwick Auction 14th April. 10 years ago Douglas Saville gave us a talk on “Numismatic Books, Old and New”. This evening 30 years ago was a Coin Fair. Throughout history there have been many instances where leaders have debased the coinage to finance their self enhancing exploits. Some have been even more enterprising, such as our own James II who issued the Irish Gun Money tokens. Having fled to France to escape the wrath of the invading William III, the French persuaded him to reclaim his crown by engaging William’s forces in Ireland. But having little or no money to pay his troops he made tokens from scrap metal with the idea that they could be redeemed for regal coinage once he was reinstalled as King. And we all know the outcome. However, others must have been aware of this ploy and here is a similar story. 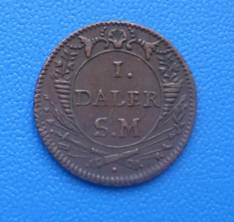 The little 24mm diameter copper token above is an emergency 1 Daler token of Sweden, one of a whole series issued in large numbers. The saga begins with Charles Pfalz-Zweibrucken (1682-1718) becoming king Charles XII in 1697. His main passion in life was not courtly affairs, but politics and military campaigns. This was just as well because when the triple alliance of Norway, Denmark & Poland + Russia launched the ‘Great Northern War’ Charles was up to the challenge. Being a skilled military commander he defeated the alliance. This was followed by several victories in Russia but eventually his weary army was defeated at the battle of Poltave (1709) and Charles spent the next few years as an exile in the Ottoman Empire. Charles was renowned for his energy and endurance during military campaigns and pushed his army too far. This is clearly evident when, in 1714, he decided to return from Turkey to Sweden and forced his entourage to reach Sweden in just 15 days. At home he found Sweden under attack from those all around (Norway, Denmark, Poland, and Russia) and immediately took charge of military affairs. And now we have the same problem as James II – no money for his planned attacks on Norway. So Charles in his usual brusque manner ordered the chief minister, one George Heinrich von Görtz to get the money by raising taxes, or by any other means. To make matters worse Görtz was in awe of Charles and he completely ignored the anger of the people due near bankrupt state of the nation. As assets were extracted from the populace so they were replaced by paper notes and copper tokens to be redeemable in better times, a repeat of the Gun Money saga. However, the real problem was the huge quantity of tokens Charles issued, which was far beyond what Görtz could cope with. Realising this, Görtz entered into secret peace discussions with the Russians, while the hatred of the people escalated. Then came the bombshell - in 1718 Charles was killed while on campaign in Norway, although there were rumours he was assassinated by factions from a war weary nation. The successors then realised the terrible plight of the nation’s finances and looked for a scapegoat to divert the anger of the populace. Never mind that it had been Charles that had bled the country dry they held poor Görtz responsible. A show trial was convened, based upon trumped up charges of gross mismanagement & unauthorised negotiations. The so called trial was a farce. Görtz was not allowed to speak, have any legal representation or reference to any papers. The death sentence a fore gone conclusion, some say state authorised murder as the execution warrant was probably signed prior to the trial.